I am escaping the extreme heat of Southern California and trading it for some mid 80s in Oregon today! Thank goodness! We're supposed to hit 109F here in So Cal by Saturday. So, SO glad I am going to miss that! 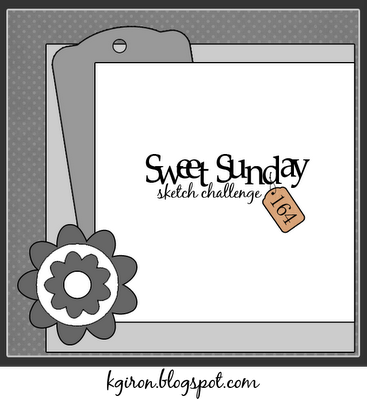 In honor of my departure from the heat this morning, I have a little card using last week's Sweet Sunday Sketch to share with you! I have to admit that I stared at this one for a while with absolutely no inspiration. That big square image panel through me for a loop. I finally realized I could cheat and put an image and a sentiment! Phew! I pulled out these adorable Love Monsters from Taylored Expressions. I just love these little guys! I spent some quality time with my copics coloring these little guys, and added some glossy accents to their eyes for a little dimension. I separated the image from the sentiment with some baker's twine and finished the card off with a button/twine bow combo. I'm off to visit my amazing best friend and my sister is going to pop over for a visit while I'm up there as well! It's going to be an amazing week!